One of the longest running community events on the Monterey Peninsula, the 57th Annual Great Sandcastle Competition 2017, returns to Carmel Beach Saturday, Sept. 16. 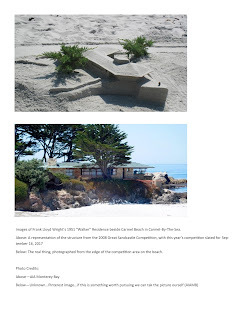 Carmel, CA, June 20, 2017 — One of the longest running community events on the Monterey Peninsula, the 57th Annual Great Sandcastle Competition 2017, returns to Carmel Beach Saturday, Sept. 16. 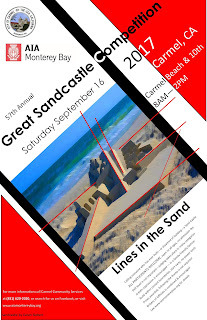 Co-sponsored by the city of Carmel-by-the-Sea and the American Institute of Architects Monterey Bay, the festive event will take place from 8 a.m.-2 p.m. Saturday, Sept. 16, on Carmel Beach, south of 10th Street. This year’s theme is “Lines in the Sand,” which each participant in the contest are free to define in their own way. Historically, the yearly competition was held on a Sunday, this year is different to allow greater participation from contestants who may be traveling from further away. The contest is open to everyone with the only rules being that no machinery can be used and the only decorations allowed are those that can be found on the beach. The best “sand castle” wins the coveted Golden Shovel Award, with other awards including the Sour Grapes award and Best Traditional Sand Castle. Every participant in the contest goes home with a plaque commemorating their handiwork. The event is free and open to the public and is held rain or shine.